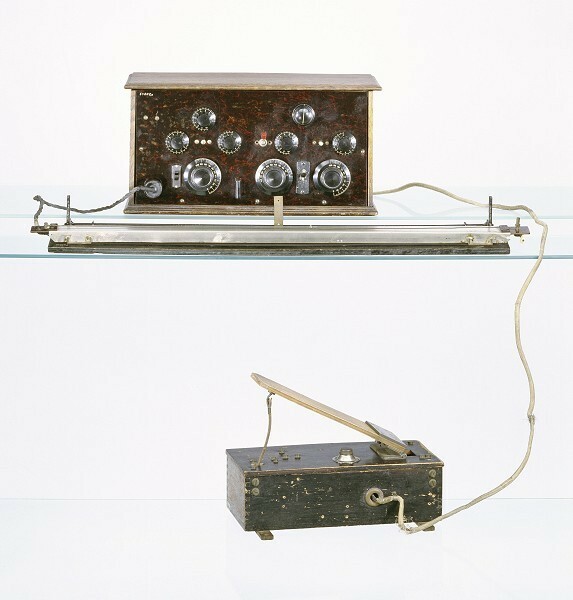 The Trautonium was an important electronic musical instrument developed by the electrical engineer Freidrich Trautwein in Germany in 1930. 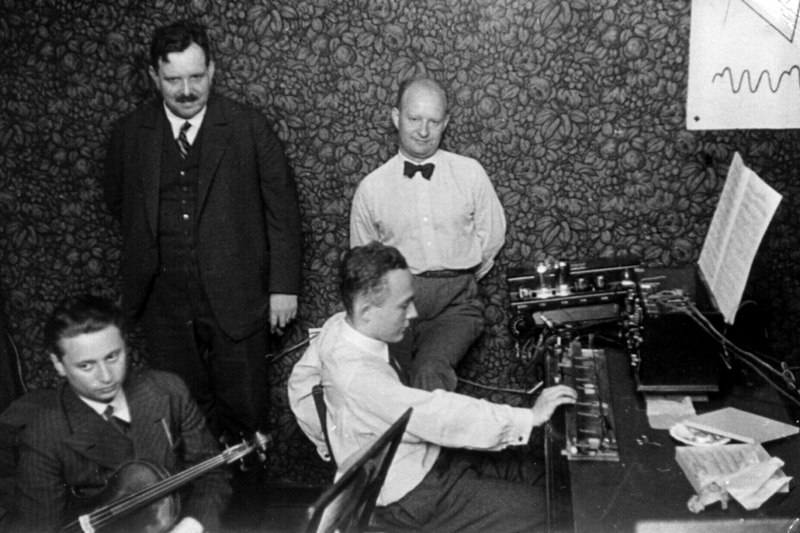 Trautwein designed the first version of the instrument with the aim of freeing the performer from the restrictions of fixed (Piano) intonation. To achieve this, he removed the usual piano-style manual in his design and replaced it with a fingerboard consisting of a metal wire stretched over a rail, marked with a chromatic scale. By pressing the wire, the performer touches the rail below and completes a circuit generating a tone. 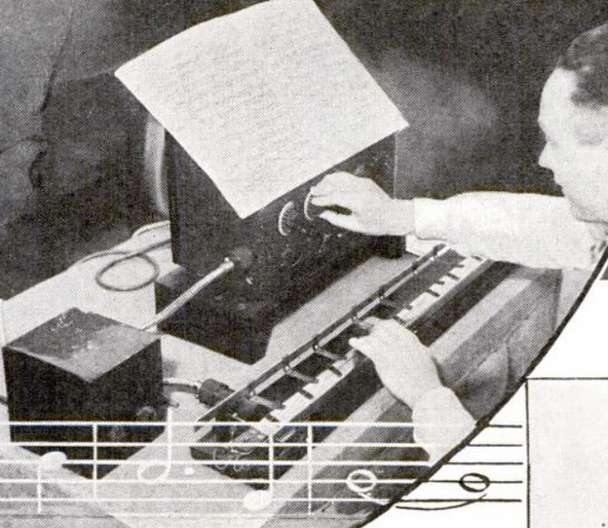 A similar technique, copied by the Trautwein, was a feature of Bruno Hellberger’s Hellertion in 1929 and some time later in the Ondes Martenot. 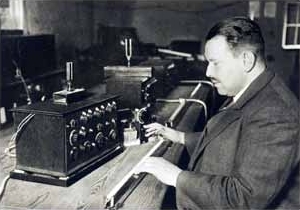 Trautwein demostrating the early Trautonium c1933, showing the pressure sensitive resistant finger-wire controller. The position of the player’s finger on the wire determines the resistance in the wire which in turn controls the pitch of the oscillator. This unusual approach allowed a great deal of expressive flexibility; by pressing harder on the wire, the player could subtly change the volume, and by moving the finger from side to side the instrument could produce violin like glissandi or more subtle vibrato effects. Overall volume was controlled by a foot-pedal allowing the performer to vary the volume and envelope of the notes. The first Trautonium was a fairly simple monophonic vacuum tube ‘synthesiser’ generating sound from a single thyratron RK1 tube oscillator. However, by passing this tone through a series of resonant filters this simple sawtooth waveform could be coloured with a wide range of timbre characteristics. This unique form of subtractive synthesis (i.e. filtering down an existing complex waveform rather than creating a complex waveform from combinations of simple sine waves) produced a tone that was distinctive and unusual when compared to the rather plain sound of other valve instruments in the 1920-30’s. 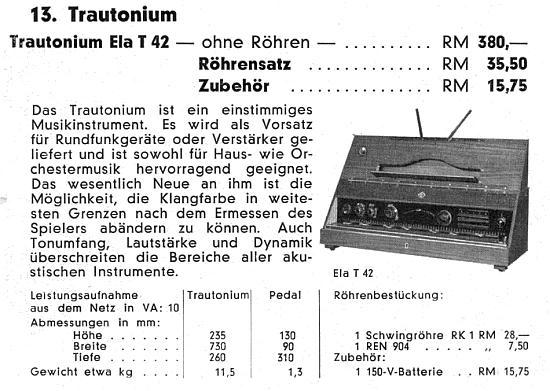 The commercial version of the Trautonium or ‘Volkstrautonium’ was manufactured and marketed by Telefunken in 1932. But, probably due to the unpopularity of a new, somewhat complicated keyboard-less instrument and high purchase price (c400 Reichs Marks; equivalent of two and a half months of a worker’s salary or more than five times the price of radio), only around thirteen items were sold and by 1938 it was discontinued. 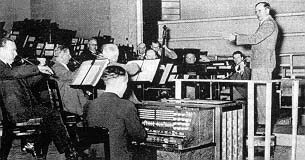 Despite the lack of domestic commercial interest, a number of composers wrote works for the instrument including Paul Hindemith ( who, switching allegiances from Jörg Mager’s Sphäraphon, learnt to play the Trautonium) ‘Concertina for Trautonium and Orchestra’ , Höffer, Genzmer, Julius Weismann and most notably Oskar Sala. Sala became a virtuoso on the machine and eventually took over the development of the Trautonium producing his own variations- the ‘Mixtur-Trautonium’, The ‘Concert-Trautonium’ and the ‘Radio – Trautonium’. 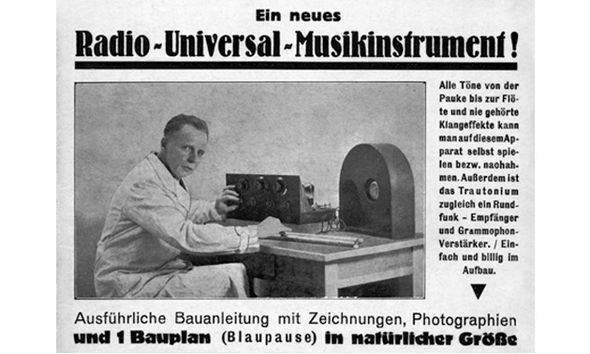 After the commercial failure of the instrument Trautwein abandoned further development to Oskar Sala who continued to work with the Trautonium until his death in 2002. 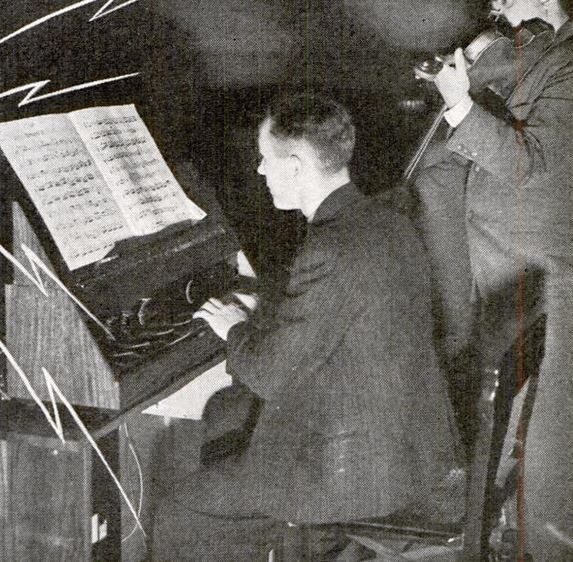 Trautwein also produced an ‘Amplified Harpsichord’ in 1936 and ‘Electronic Bells’ in 1947. Dr Freidrich Adolf Trautwein (b Würzburg 1888, Germany; d Düsseldorf 1956) seen here in 1930. Trautwein studied electrical engineering at the Technical University of Karlsruhe and later, law in Berlin. In the First World War he was a lieutenant in the German Army and led a mounted radio squad. After the war in 1919 he studied Physics in Heidelberg and Karlsruhe where he received his PhD in engineering. 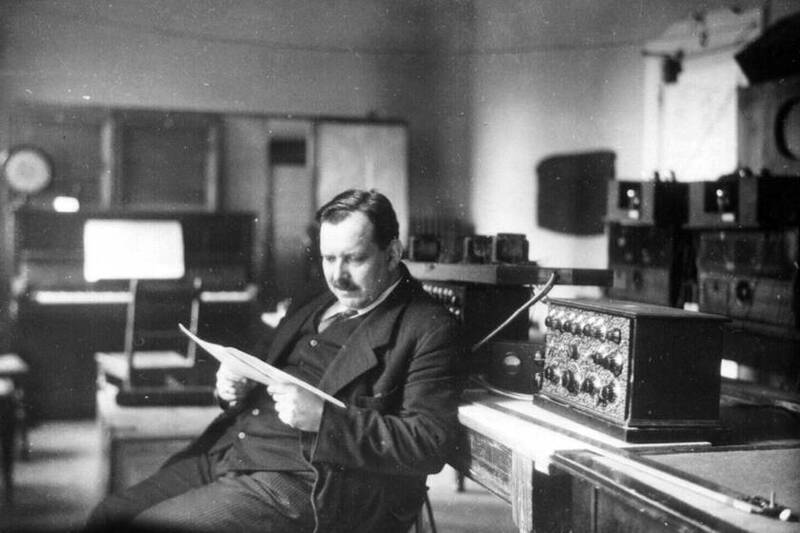 The following year he started working for the State Telegraph Service where he was involved in the establishment of the first German radio station in Berlin. 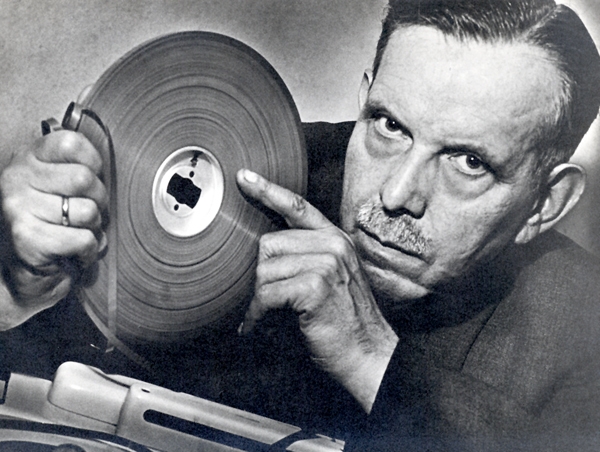 In 1949 Trautwein worked in briefly at the Bikla School for Photography and Film in Düsseldorf and then established the sound engineering course at the Düsseldorf Conservatory (now the Robert-Schumann-Hochschule in Dusseldorf ) which still forms the basis of the current sound engineering training unit. 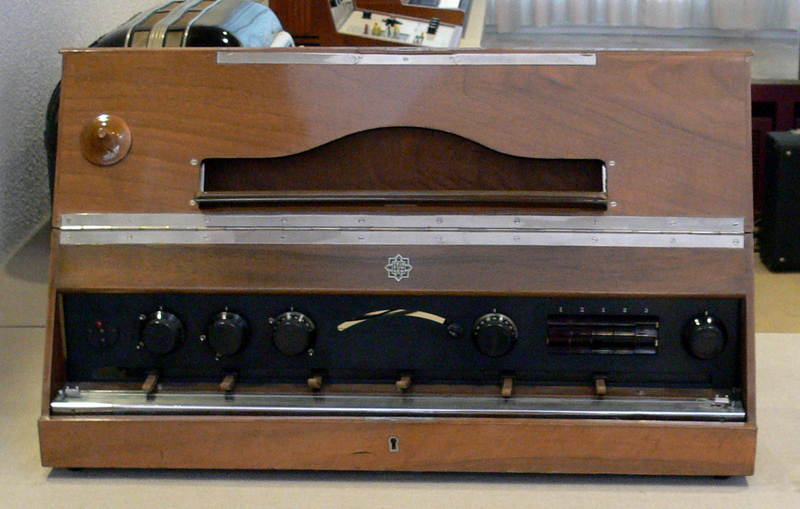 In 1952 Trautwein developed an evolved version of the Trautonium for WDR Electronic Music Studio, the Electronic Monochord. Trautwein died in Düsseldorf in 1956. Peter Donhauser: Electric sound machines Böhlau, Vienna 2007.